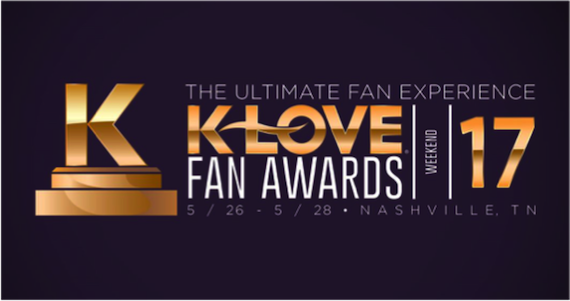 The 5th Annual K-LOVE Fan Awards will feature a host of performers Sunday night (May 28) at the Grand Ole Opry House, including 7eventh Time Down, Big Daddy Weave, Britt Nicole, Colton Dixon, Crowder, Danny Gokey, for KING & COUNTRY, Hawk Nelson, Jeremy Camp, Jesus Culture, Kari Jobe, Love & The Outcome, Mandisa, Matthew West, MercyMe, Natalie Grant, One Sonic Society, Ryan Stevenson, Tauren Wells, Tenth Ave North, We Are Messengers and Zach Williams. Presenters added to the show include Dave Frey (Sidewalk Prophets), Francesca Battistelli, Julianna Zobrist, Matt Hammitt, Nichole Nordeman, Peter Furler, Phil Joel, Sadie Robertson and Steven Curtis Chapman. As previously announced, this year’s K-LOVE Awards will be shown on the big screen. Presented by Fathom Events and John Sanders LLC, The K-LOVE Fan Awards: Ignite Hope will be shown in movie theaters nationwide on Tuesday, June 13 only at 7 p.m. CST. Tickets can be purchased online by visiting fathomevents.com or at participating theater box offices. Fans across the U.S. will be able to enjoy the show in more than 500 select movie theaters through Fathom’s Digital Broadcast Network (DBN).